Traveling East on I-10 (Exit 28). Take SR-263 (Capitol Circle) South 12 miles. Turn right (South) onto US-319/SR-61 (Crawfordville Hwy) for 2 miles. Bear left onto SR-61(Wakulla Springs Rd) for 6 miles. Turn left onto SR-267 at flashing stop light. Turn Right into Park entrance. From West I-10(Exit 30). Take SR-61 (Thomasville Rd) South. Continue on SR-61 thru Tallahassee for 10 miles. Take US-319/SR-61 (Crawfordville Hwy) South for 2 miles. 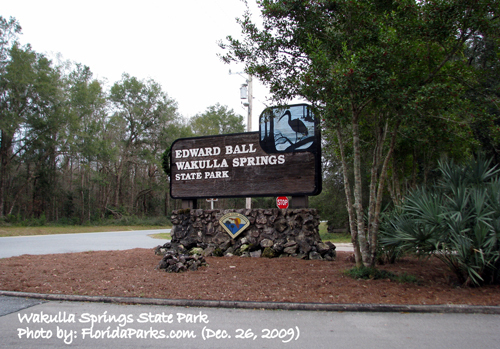 Bear left onto SR-61(Wakulla Springs Rd) for 6 miles. Turn left onto SR-267 at flashing stop light. Turn Right into Park entrance. Wakulla Springs offers two different type of Ranger guided boat tours. Both are unique and tour natural areas where wildlife is abundant and boat traffic is limited to only the park tour boats. Generations of wildlife have become accustom to the tour boats and are oblivious to them making for great photographic opportunities. The Glass-Bottom Boat Tour is a 30-minute trip over Wakulla Spring, one of the world's largest and deepest freshwater springs. Peering down through the clear water to a depth of 125 feet, Park Rangers will share the mysteries and history of this unique natural area. Large gar, mudfish, bream and bass are observed, as well as, the catfish convention. One of the highlights will be observing the antics of "Henry, The Pole Vaulting Fish". Stories will be told of local folklore and passengers will see prehistoric Mastodon bones on the bottom of the spring basin. Nature trails located along the park drive provide convenient access to the many plant communities found in the park. A six-mile hiking trail is provided through the use of park service roads. Picnic areas including tables and grills are provided within the park. Swimming is allowed only within the designated swimming area near the spring. An observation and diving platform at the spring head allows a splendid view of the spring.